Kids and backpacks just seem to go together. Whether sending them off to school, to a sporting event or for a sleepover with a friend, chances are they are be bringing a backpack. But carrying a heavy load unevenly or improperly can result in poor posture and even distort the spinal column, causing muscle strain, headaches, neck and arm pain, and even nerve damage. At out clinic we see many children with mid back pain, lowback pain, headaches, and even scoliosis aggravated by carrying an overfull back pack. · Choose a bag made of lightweight material, such as vinyl or canvas. · Pick a bag that has two wide, adjustable and padded shoulder straps, along with a hip or waist strap, a padded back and plenty of pockets. · Ensure the bag is proportionate to body size and no larger than needed. The top of the pack should not extend higher than the top of the shoulder, and the bottom should not fall below the top of the hipbone. · Explore other options like bags with wheels and a pull handle for easy rolling. · The total weight of the pack should not exceed 10 to 15 per cent of the wearer’s body weight (depending on age). · Make sure the backpack contains only what is needed for the day or activity. · Spread the weight throughout the pack. · Pack the heaviest items close to the body. · Both shoulder straps should always be used and adjusted so the pack fits snugly against the body. You should be able to slide a hand between the backpack and the wearer’s back. · The pack should sit two inches above the waist. 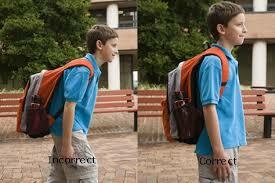 · Never allow your child to sling a backpack over only one shoulder. · The waist strap reduces the strain on the back and transfers some of the load to the hips.